The Nathan Chris Baker Foundation encourages everyone to pay it forward and to do things for others that will have a lasting impact. 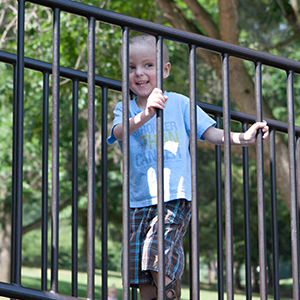 We recently had the opportunity to sponsor four year old Bohde with a Day of Greatness. Bohde has been fighting cancer for well over a year and it goes without saying that Bohde is a trooper. His mom, Jami, is a trooper as well. Jami lost her young husband to cancer, several months after the birth of their daughter and only months before Bohde was diagnosed. Yet Jami finds the strength and courage to take every new day head on; caring for her two year old daughter, ensuring that Bohde’s treatment continues as planned, all while still grieving for the loss of her husband and trying to find time to take care of herself. When we began preparing the details of Bohde’s day, our goal was to give him a day that he and his family and friends would cherish forever. It would give them all a break from thinking about the next doctor’s appointment, the next step in the course of treatment and possibly a day that would build everlasting memories. As the day came together, we were blown away with the compassion and generosity of all involved: Jonce at Bayside Limos who helped provide limo transportation through the day; Kristi at Hoppers Kid Zone who opened her doors to just Bohde and his crew; Sandy and Deb at Piney Run Park who not only opened the park for our use, but also brought out animals for just Bohde and his friends and family; Matt Robinson with M.R. Balloon whose wife painted faces and made balloon animals; Chief Welker at New Windsor Volunteer Fire Company who let Bohde see and feel just what it is like to be a real fireman; and Joanna Little, who spent her day capturing the memories on film. The day was a huge success because of so many caring people. And yet, we feel that that the Day of Greatness for Bohde was a Day of Greatness for us as well. Seeing the smiles on all of their faces was a gift to us. The kindness that we saw in others was another reminder that people are good and compassion is abundant. During his Day of Greatness Bohde wore a shirt with “Stronger than Cancer” written on the front. There is no doubt about it. He is stronger than cancer. He is stronger than cancer ever will be. He and his family are proof that through hard times, and in the face of tragedy and sorrow that life sometimes throws our way, happiness and strength can be achieved. Sometimes it comes from deep down inside of you. Sometimes it comes from the help of others. Sometimes it is a combination of both. The bond that we gained with Bohde and his family will be one that continues beyond the Day of Greatness. We personally thank Bohde and his mom for allowing us to take part in such a wonderful Day of Greatness. If you know of an individual or family who could benefit from a Day of Greatness, please fill out our application here, or if you have any questions, please email us at GoOutBeGreat@nathanchrisbaker.com.